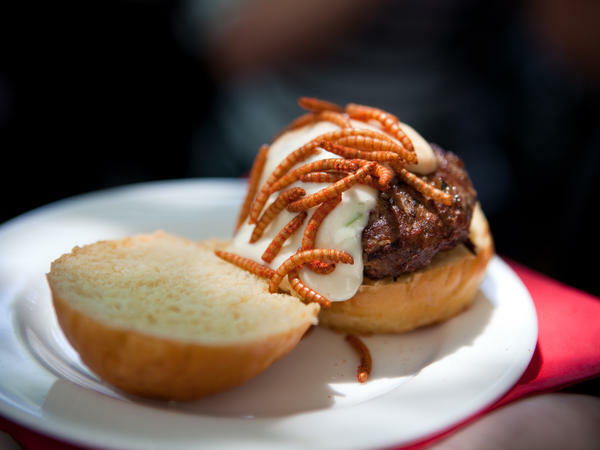 A Grasshopper Burger topped with Mexican spice mealworms. Andres Escobar, a Pestaurant attendee, enjoys a grasshopper burger garnished with Mexican spice mealworms. Nancy Troyano, an entomologist with Ehrlich, tries her very first insect. John Mongini from Flagstaff, Ariz., munches on a cricket. Wincing at first, Mongini eventually decides he likes them. 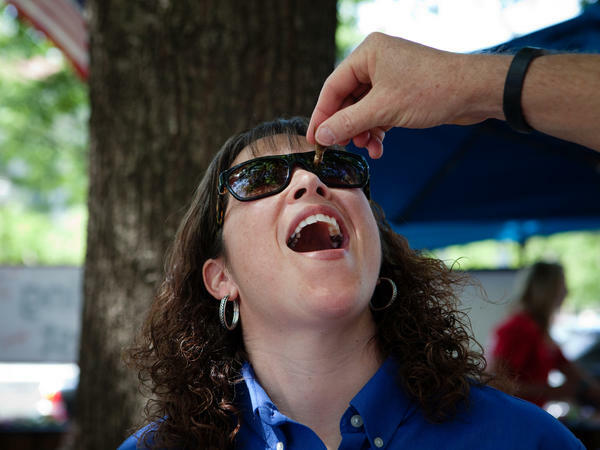 Katherine Eklund, with D.C Central Kitchen, competes in a cricket eating competition. Matt Schnarr bites into a mealworm lollipop. The Pestaurant also had ant and cricket lollipops available to taste. If you're a scientist and you work for a pest control company, you're used to thinking about bugs as the enemy you're trained to kill. Now try putting one in your mouth. It took some mental rearranging for Nancy Troyano, an entomologist for Ehrlich Pest Control. But on Wednesday she did it for the first time in her life. "I'm used to looking at grasshoppers under a microscope," Troyano tells The Salt. "I know what their internal organs and the spines on their legs look like, so I was kind of thinking about them." Troyano actually had no intention of eating any insects at the event. Her company sponsored the tasting at the Occidental Grill in Washington, D.C., just a half block from the White House, and she was there to talk about what the company does. But then her boss, Ehrlich CEO John Myers, pressured her into it. And she was pleasantly surprised: "It didn't taste so bad — kind of like baked potato chips." Troyano was among many skeptics who found much to like about the pop-up Pestaurant, which drew tourists and Washingtonians onto the Occidental's patio for about four hours Wednesday to taste grasshopper burgers, roasted crickets, Mexican spice mealworms and ant lollipops. It was one of 12 Pestaurant events sponsored by Ehrlich and its parent company around the world. John Mongini, from Flagstaff, Ariz., initially winced at his first taste of cricket. But after a few chews, he relaxed, describing them as "kind of like sunflower seeds." Perhaps the greatest gastronomic success of the snacks laid out for the noshing were the turkey burgers with ground-up and whole grasshoppers mixed in. The juicy, grilled burgers were garnished with peppers and lettuce and served with an array of gourmet condiments. And there were two key reasons they were delicious: They'd been concocted the night before by Rodney Scruggs, the Occidental's executive chef. And they included a brilliant secret ingredient: duck fat, to keep them moist. "I've never cooked with insects before, so this was new territory for me, but it took on a life of its own," Scruggs says. "The grasshoppers gave the burgers a musty, earthy flavor, like a dried mushroom." The match-up, however, of one of Washington's most iconic grand dame restaurants and a pest control company headquartered in Reading, Pa., was a bit puzzling. Why exactly would exterminators throw a free luncheon to give out grasshoppers, mealworms and scorpions? "We're not recycling insects that were captured in people's homes," Ehrlich's CEO John Myers insists. Moreover, says Troyano, the only bugs being served that could be considered pests would be the crickets: "They're occasional home invaders." Instead, Ehrlich was there for three reasons: "to have fun, raise awareness about the serious business of pest control and raise money for hunger," says Myers. The idea, Myers says, came from Ehrlich's parent company, Rentokil, which sponsored the first Pestaurant in London in 2013. "They expected 200 people and got 2,000," he says. For the charity part of the event, Ehrlich had committed to donate a few dollars for everyone who tried the bugs to D.C. Central Kitchen, a local non-profit. And while Ehrlich isn't in the business of raising insects or directly promoting their consumption, Myers notes that he does see them as a viable solution to hunger. As we reported last year, insect cuisine isn't just a kooky San Francisco fad anymore. The U.N.'s agricultural arm has been speaking up about why insects should be an option for dinner. Among the attendees of the D.C. Pestaurant was Sonny Ramaswamy, director of the National Institute of Food and Agriculture at the U.S. Department of Agriculture. In an email to The Salt, Ramaswamy says he was pleased to see so many people partaking in bugs at the event. After all, insects are nutritious, and more efficient and better for the environment than other protein sources. "Edible insects are going to be part of the toolkit for us to achieve global food security," he says. "Unfortunately in Western countries we will need to overcome the 'yuck' factor, and events like Pestaurant will go a long ways to help people overcome the same."